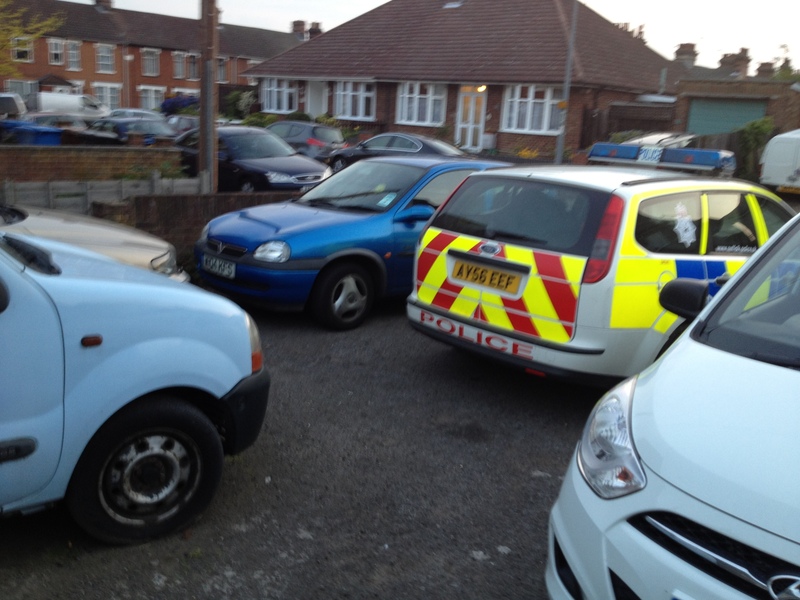 Coming home recently I have notice police cars parked in illegal and/or antisocial ways on a number of occasions. 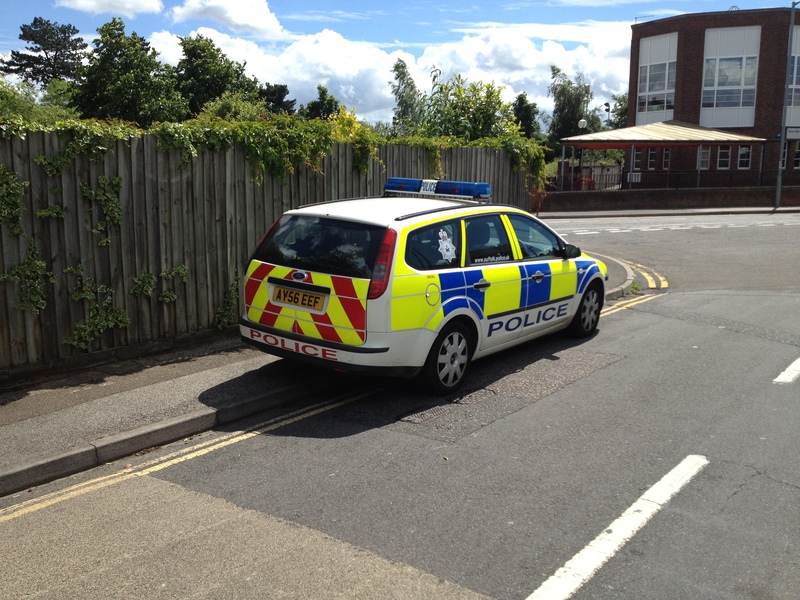 In this first incident they had parked a marked police-car with two wheels up on the pavement on a double yellow line and probably within less than 10 meters from a junction. So was it a big emergency? Ok, not an emergency at all, just a routine traffic speed patrol. I politely asked them if they could re-park legally which they were fine about it, but why don’t they do it as a matter of course? And then there was the time a few weeks back when I noticed this police car parked with its bonnet slicking out blocking the entire pavement. OK, so it might have been an emergency, but actually when to looked at the back of the vehicle there was loads of space into which the driver could have reversed. Why does this matter, I hear many motorists thinking? 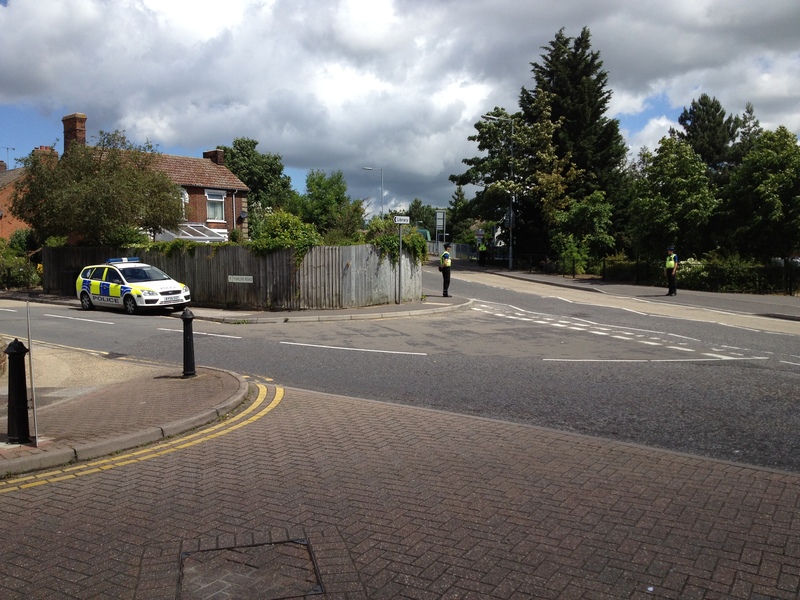 It matters because it shows that there is a culture in the police that pedestrians and the pavements they rely on are less important than motorists and their needs for convenient places to park. One could possibly call it ‘institutional motoristism’ and then look at how society has dealt with other ‘isms’, such as racism and sexism (and homophobia)? All of these other ‘isms’ were endemic in both the police and also society but needed to be dug out of the police force before the wider societal issues could be addressed effectively. Institutional motoristism (or possibly just ‘motorism’) has a more nasty side when the police side with aggressive motorists who threaten or assault pedestrians or cyclists. Check out ‘The Cycling Lawyer‘ blog for a cyclist/barrister’s view on the bias in favour of motorists as demonstrated by both the police and the judiciary. A comment has just be left below noting that Chris Hutt, the late author of the ‘Green Bristol Blog’ proposed the term ‘institutional motorism’ back in 2010 which he defined as being ‘a deep rooted prejudice in favour of motorised traffic at the expense even of the safety, let alone the convenience, of those that dare to travel on foot or bicycle‘. That is certainly what I was referring to and is easier to say that motoristism! Neither have quite the same root as racism or sexism – to follow those it would have to be ‘transport-modeism’ which doesn’t really work or ‘modeism’ which doesn’t mean anything useful at all. As such motorism seems to be the one to use. What is encouraging is that the term seems to be picking up gentle traction. ‘At War With the Motorist’ used the term in July 2011 saying “In the 1950s the future was the car and road transport, and for five decades TfL could get away with their assumptions and their institutional motorism. The times are a changin’. We need to show TfL that they can’t get away with this in 2011“. Apparently they picked up the term from ‘People’s Cycling Front of South Gloucestershire’ in their ‘Institutionalised Motorism near UWE‘ post from July 2011. The term is also turning up in comments on blogs around the web. 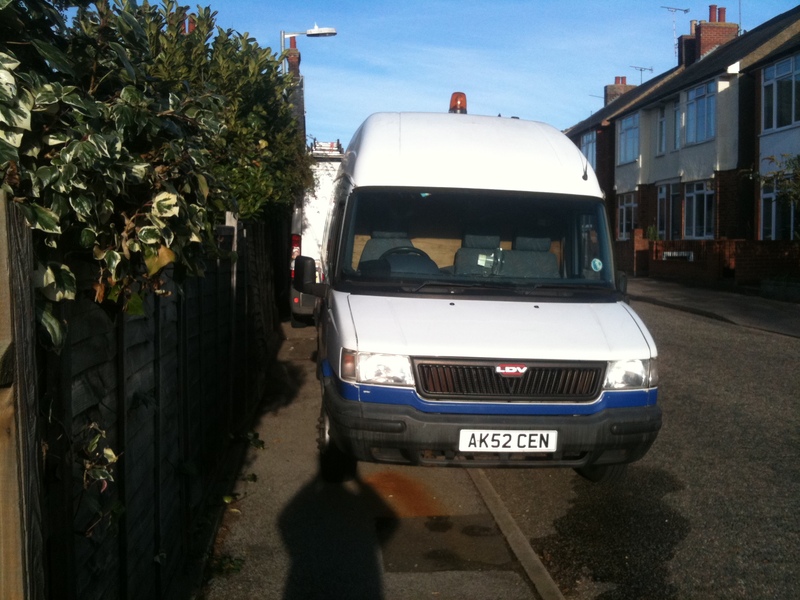 Nottinghamshire Police in the Broughton Astley & Walton area have put out a warning that they are going to get tough on pavement parking. here as a screen-grab from their website. I just wish other police forces would take such a clear stand in support of vulnerable road users! 2. 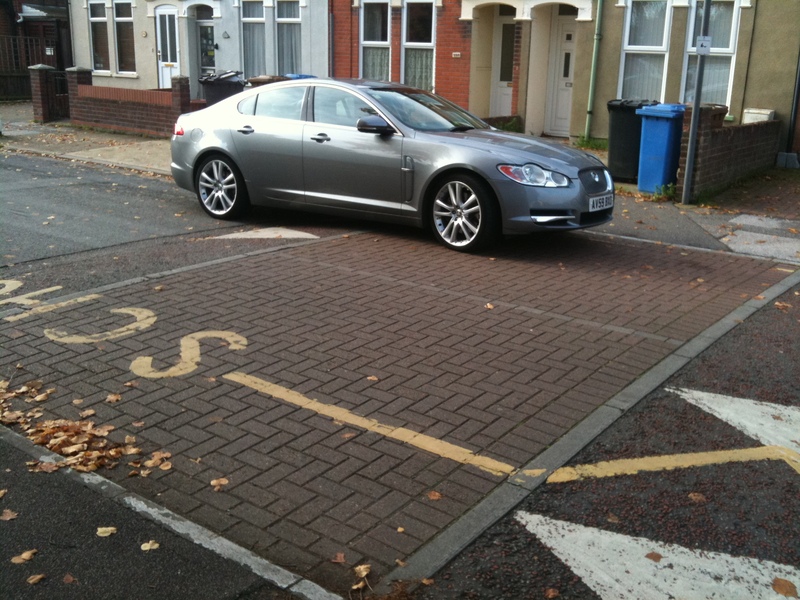 Must NOT park on dropped kerbs for wheel chair access! 3. 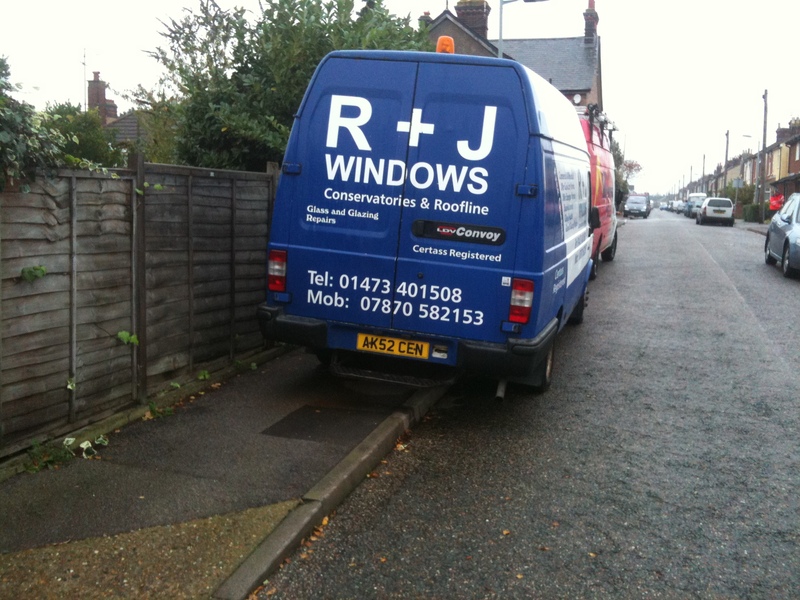 Must not park blocking driveways! Localism, or mob rule supported by the police? Localism, the new coalition policy, is about allowing local people more say on what happens in their local area. The government’s plain English guide to Localism explains that “Instead of local people being told what to do, the Government thinks that local communities should have genuine opportunities to influence the future of the places where they live” (page 11). By contrast, mob rule (or, it give it it’s official name Ochlocracy) is a form of government where a vocal and intimidating group impose their will on a community. The Wikipedia article on Ochlocracy defines it as “government by mob or a mass of people, or the intimidation of legitimate authorities“. I note this recent article in the Financial Times on the risks of mob rule titled “Risk on the rise as political leaders give in to mob rule” showing how the current banking mess could descend into something very scary. 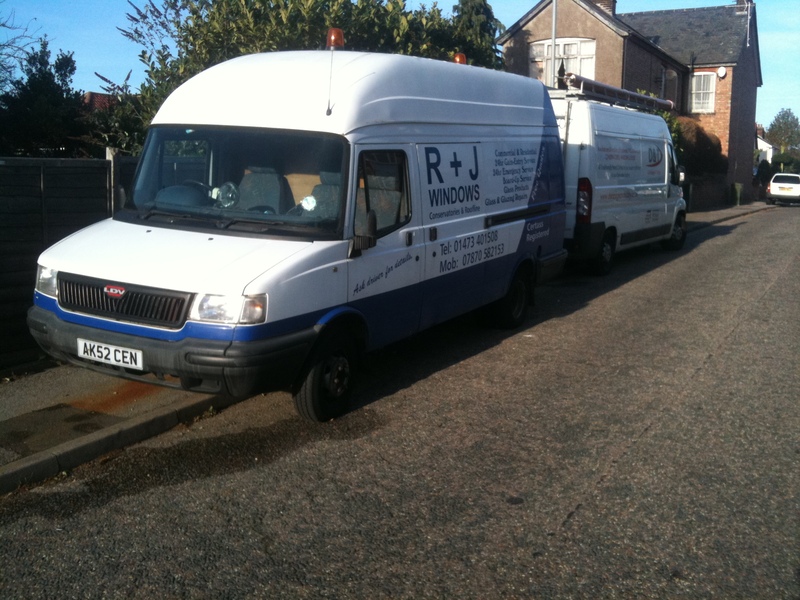 So.. when the police explained to me that they were not giving the owner of these vehicles pictured below a ticket because a number of people in the area didn’t want them to were they acting in the spirit of localism, were they being intimidated into not performing their legal duties or were they just being pragmatic? Is it the police’s job choose where to apply the law and where not? 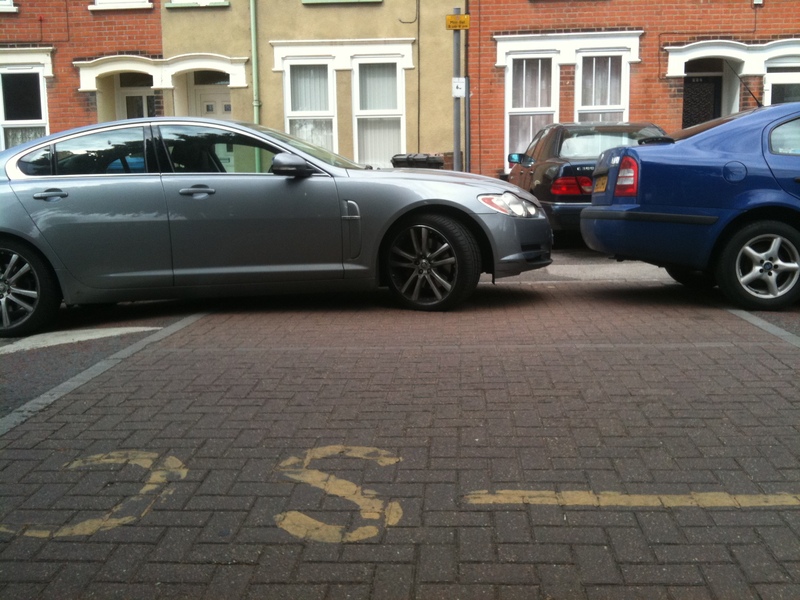 Before deciding not to put a ticket on the vehicles did the police do diligent door to door inquiries to see if there were any disabled people or old people who would like to get out safely, or children, or parents who walk to school but find the parking in the area just too difficult? I am sure they didn’t. The police do however have a newspaper cutting of the April 1 event we staged on the same street highlighting the difficulties that parents with young children have using the pavement on their noticeboard which they take round schools. 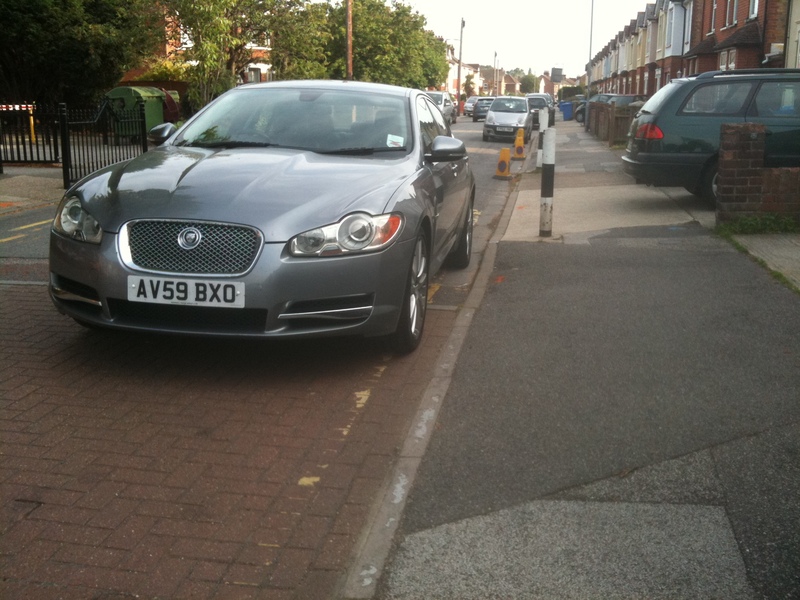 It seems hard to square that with allowing 100% blockage of the pavement because a few neighbours want it. Fyi, these vehicles are breaking numerous very clear laws – in particular parking against the flow of traffic at night and parking at night without sidelights (a special rule for commercial vehicles over 1525kg curb weight) – and these streets are unlit between midnight and 5am. There are also the harder to prove offenses of ‘driving on the pavement’ and ‘causing an obstruction’. In 2009 a father phoned to police to say that because the country road between his house and his child’s school was dangerous, and because his son wanted to walk to school that he was going to drive slowly behind him to protect him from approaching drivers on the 60mph country lane. He was then intercepted before he had got to school by police to who drove the boy to school over “fears for his safety” and warned the father that he could be arrested for ‘a willful obstruction’ of the highway if he did it again. The father has subsequently written an article titled “Why do drivers have more rights than the rest?” (paywall). A good question which I will explore below. Let’s analyse this in some detail. It is also worth mentioning that the highway code reminds drivers to at all times “Drive at a speed that will allow you to stop well within the distance you can see to be clear“. (rule 126) According to the Crown Prosecution Service, driving too fast is reason for prosecution for dangerous driving for which the penalty is disqualification and up to two years in prison. (Careless driving, a lesser offense is not use in cases of driving too fast it seems). However a 25 year old found guilty of drivng at 103mph avoided a conviction for dangerous driving and was banned for only 90 days. A policeman who was ‘familiarising himself with his new police car’ who was recorded driving a 159mph, (and also at 120mph in a 60mph area and at 60mph in a 30 mph area) was found not guilty of both dangerous driving and of speeding! The Crown Prosecution Service overturned the ruling and he was subsequently found guilty but given an absolute discharge; before having his conviction overturned following an appeal by West Mercia Police Federation. So, was the father acting ‘reasonably’? He appeared to be protecting a walker who wished to assert their right to walk along an ‘all purpose road’. Motorists appear to have been only inconvenienced to a minor degree. The police seemed to agree that motorists were traveling too fast to slow down safely for a slow vehicle. As such should they not have prosecuted the drivers for dangerous driving, rather than opting for the a simpler but rather implausible route of using wilful obstruction for the person protecting the pedestrian? I am reminded of Duncan Cameron’s submission to parliament on pedestrian issues who noted that “If pedestrians placed a chair on the carriageway it would be removed immediately, even though it would obstruct a smaller proportion of the road than when a car parks on the pavement. Cars could slow down and take care to avoid the chair, as pedestrians have to with parked cars. 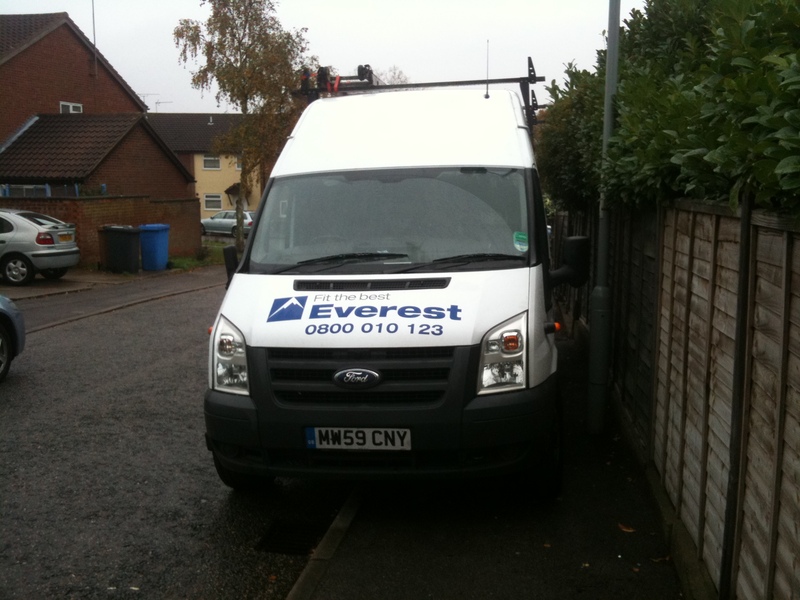 The Highways Act applies equally to the road and the footway. Pedestrians are being discriminated against“. In this case the same police who normally avoid using obstruction legislation against parking obstructions at almost any cost leapt into action to use it against someone protecting a pedestrian. Remarkable! There are some parallels in this story with that of the blind man who was arrested and locked up within minutes of phoning the police to say that he was going to let down the tires of cars that were persistently blocking the pavement. Yes, pedestrians do face discrimination and this blog’s primary aim seems to be to help expose how this particular discrimination operates. Back in October 2010 a PC Roderick Lund was awarded £5,000 in damages after suing his own force for unlawful arrest, false imprisonment and using unreasonable force in relation to a parking incident! It seems that Lund’s next-door neighbour, who was himself a retired police superintendent reported Lund to the police saying that his car was causing an obstruction. 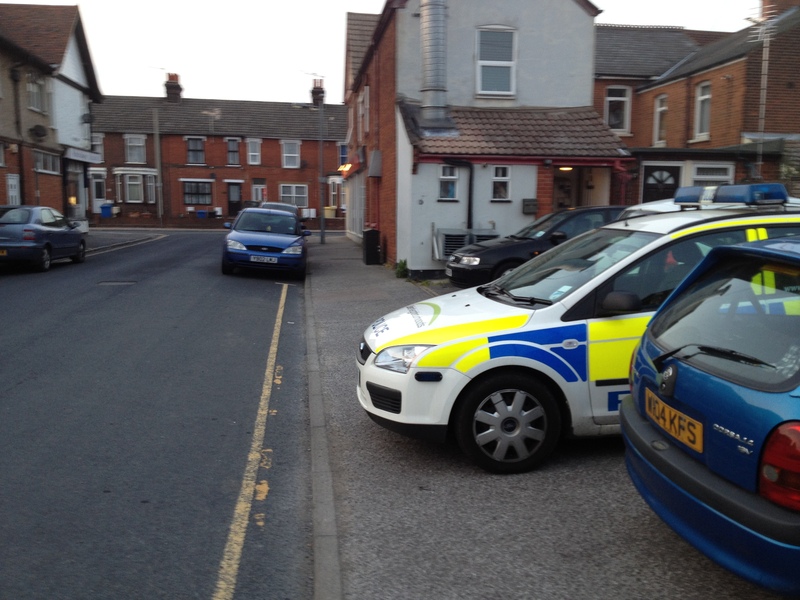 Duty officers arrived, agreed and asked Lund to move it which he refused to do saying that he had had a drink. The conversation became more heated with Lund challenging the duty officers motives; Lund was arrested, led away in handcuffs and detained for 10 hours. I wonder if these officers might like to return and deal with the cars and bins that seem to be regularly left obstructing the pavement of the same street. Of course, this is all pretty tame compared to South Africa where the police traded blows and drew guns on each other when traffic officers attempted to tow a police car belonging to another force. At least the people involved in the above incidents lived to tell the tale which was not the case for one off-duty policeman in Baltimore who was killed in a dispute over a parking place in which he was hit on the head by a rock in 2010. 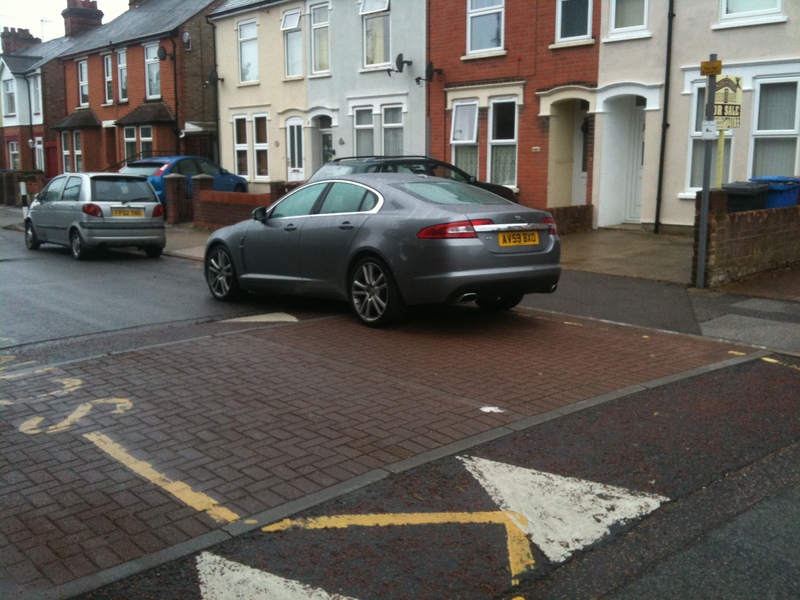 I have reported this Jaguar car to the police on a number of occasions for parking in a raised crossing outside a local primary school over the past 9 months – the car even takes pride of place at the the top of our ‘Rogues gallery‘. I saw the owner in his car today for the first time. He told me that the police has visited him about 3 months ago and said that it was OK for him to continue parking as he was. I am very surprised to hear that because I have personally reminded the local sergeant about the Traffic Management Act 2004 (section 86) which says that it is illegal to block a raised crossing. Possibly the police were confused because there is also a single yellow line which doesn’t apply after 6pm. Whatever the truth is, it is clear that the guy didn’t stop parking illegally so the police can’t have done much to enforce the law. 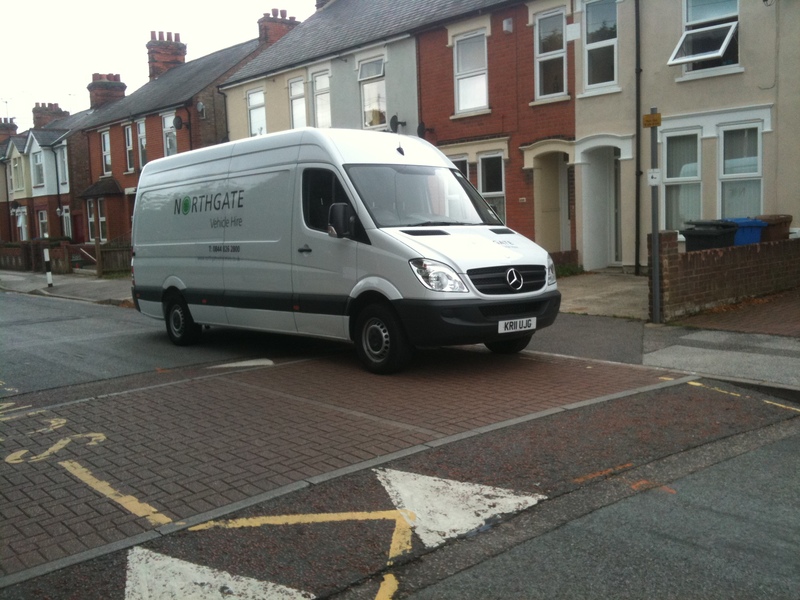 The guy told me that he was moving today, so as a send-off here are some of the photos taken over the past 9 months including one taken today of the van he is using to move house parked up on the raised crossing as well! I will send a copy of this post to my local sergeant in a few days to remind him to respond to my last two letters on the subject. I will include any (polite) messages that are left at the end of this post over the next few days. His removal van up on the raised crossing today!